Born 1962 in Mexico City to parents of German and American descent, Norman Muller was influenced by international art and culture at a very young age. A son of an affluent architect, at 15 years old Muller observed the analytics of composition, exactness of foundation and the manner of which line and form add to one another. The architecture of Mexico City exposed itself as a base for what was to effect the direction of his art. Mexico City, a mecca for both old world and new contemporary sparked inspiration on many different areas for a young and budding artist. It was here where works by Diego Rivera, Siquerios, Rufino Tamayo and Pedro Coronel became early influences on the beginning of his career as a worldwide artist. In true artist fashion, Muller spent his 20’s vigorously producing in his studio. A perch above the city bustle, his creative space served as an artists dream with the historic landscape and people’s movement as his canvas. This intensely beautiful environment is where he began the exploration in the technique of deconstruction. His works quickly evolved and found a harmony through the patterning of color. 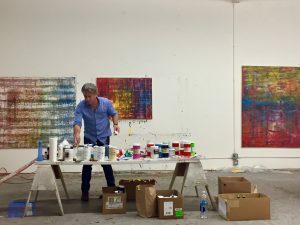 He became a fanatic about the science of Acrylics and the nature of how they layered, what techniques can be used for manipulating the paint and how they allowed for exposing texture. © Copyright Morten Gallery. All rights reserved.